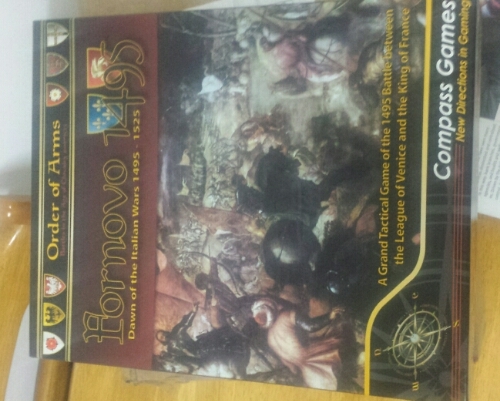 Not much for today’s #blogjune but there was a nice package waiting for me containing this board game. Maybe I’ll get to play it during this month. So I’ve been on leave for the first part of this year. We’ve relocated to the country (Meningie, on the shores of Lake Albert), which has its issues (chiefly commuting, which is now 2+ hours each way). But the benefits are wonderful (no mortgage, for a start). But I’ve yet to pick my library mojo back up. I have a back yard that needs work and I’d like to spend some time planning what I want to do. I miss volunteering during the week at the local museum. I used the local joint-use public library a lot, but didn’t read anything professional. I seem to have forgotten a lot of stuff, though I’ve learned about some new stuff too (how to paint a house, tractors). Hopefully, #blogjune will give me the professional pep that I need. I called into a telco at lunch time today to get a replacement SIM card (I won’t name them). I went to the desk at the rear of the shop (it said ‘Here to help’) and was promptly pointed to the front of the shop where a lady with a tablet took details about what I wanted. She asked me to take a seat (there weren’t any) and someone would see me in a moment. About 25 moments later someone came to replace my card (the same guy who directed me to the front initially). getting the card took about 2 minutes, and I was on my way. it wasn’t clear to me where I might be in the queue (some people *did* present at the front desk and got served) and, consequently, I didn’t trust that I *would* be served. The shop wasn’t really set up to accommodate several people having to wait, which is not the fault of the staff there. But no-one had thought about how the setup might come across to their customers. I was clearly a little annoyed and they didn’t try to sell me anything during that transaction (increasing the chance that they might later). This was very good particularly given that they probably get paid bonuses on contracts that they sell. It also helped me realise that I’ve not thought about how our library might appear to our users in a long time. We are in a joint-use arrangement with another education institution that, on the whole, works rather well. But we don’t see the numbers of some of our student groups that we used to. So there might be a problem, and I haven’t gone out of my way to find out. So I need to talk to people and try looking at what is familiar to me with a new eye. We all need a bit of a jolt occasionally. In January 1830, Agnes Magnúsdóttir became the last person executed in Iceland. She was accused, along with Fridrik Sigurdsson and Sigrídur Gudmundsdóttir, of the murder of Natan Ketilsson and Pétur Jónsson (the former her employer) in March 1828. Of the three, only Agnes and Fridrik were executed. Sigrídur’s sentence was commuted to life imprisonment in Copenhagen. It was presumed that her youthfulness made her suggestible and thus influenced by the others.This story is of her final months with the family of District Officer Jón Jónsson. Kent’s prose is sparse, befitting the setting. The District Commissioner and one of his servants are distinguished simply by their coats; ‘bright red’ for the former, and ‘worn’ for the latter. One can readily imagine the fierce winds whipping across the skins used to cover windows. Written alternately in the third and first persons, some readers might feel some disorientation moving between modes. But it is well handled in Kent’s deft prose. Reading Burial Rites gives you the sense of a writer in command of their craft. This impression is confirmed by the research that the author has undertaken. While the work is obviously an imagining of Agnes’ thoughts (and of what really happened), it is clear that much research has informed the writer’s views. What I also found particularly impressive was that, though there was a lot of knowledge behind the writing, the writing never became a display tableau for it. In general, the characters are well drawn. The District Commissioner is not simply keen for the executions to serve as a deterrent to the district’s peasants (though he is certainly that). He expresses a desire for the islanders to share the modernisation enjoyed in Denmark, for example by having glass windows. The Assistant Priest’s attraction to his charge is deftly drawn. If I were to level one criticism, it would simply be that we don’t feel the antagonism towards Agnes felt by most of the Jónsson family (in particular). While we slowly see the relationships between them thaw, we don’t feel the revelation that they did. Instead, we feel that she cannot be guilty of murder, and simply await the truth to be revealed. What we have here is a wonderfully told story of a woman whose own was ignored. Though I have only given it 4 stars, it deserves 4.9 out of 5. It is a story that you should hear. You mean parents *can* have lives? Books by Anglo-Americans reacting (usually very favourably) to French culture have a long history. Hemingway’s classic A Moveable Feast has been authors such as Julia Child, Peter Mayle Jane Paech and Sarah Turnbull, all drawn to something in la vie française. Many centre (naturally) around food. Pamela Druckerman French Children Don’t Throw Food looks at French parenting. Based on her own experiences of raising three children in Paris, Druckerman examines how it is that French parents can raise children who, on the whole, are remarkably well behaved, particularly when compared to their Anglo-Saxon cousins. Essentially, French parents don’t treat their children as though they are the centre of the universe. While this might seem shocking, it doesn’t mean that French parents don’t love or care for their kids. Instead, it reflects a philosophical and cultural divide on the role of parenting. French children are raised to understand that family life does not revolve around them. That doesn’t mean that they are unimportant (we are not in ‘children should be seen and not heard’ territory). It’s simply that, in order for the family to function effectively, the parents do not centre their lives entirely on their children. The French refer to this as cadre – a framework which sets limits for children. But the aim of these limits is to give the child a stable set of expectations from which they can explore. Children are encouraged into sleeping and feeding rhythms quite early. By the time they become toddlers, French kids typically eat three meals a day and an afternoon snack around 4-4.30pm (a goûter). While this may seem inflexible (and joyless) it does seem to provide a framework in which children can get into good food habits early. AS the book proceeds Druckerman marshals research that, on the whole, tends to vindicate French methods. Uncritical praise is not good for self-esteem. It’s good for children not to have every which catered for. What Druckerman’s observations seem to show (and science tends to confirm) is that establishing norms of behaviour (remember ‘politeness’? ), boundary setting, and integrating the child into the functioning of family life provides the best base for the child to blossom. The ​aim of the French parent is twofold. One goal for parents is to establish their authority. As you read, you’ll be introduced to The Pause, the Look, and Sage (calm). This is not to say that all French parents are authoritarian. Indeed, ideally oui ought to be heard more frequently than non. But when the answer is non, it must be firm and unyielding. The other aim is educative. In a sense, the whole of French childhood is seen as a means of education. This does not mean Mandarin tutors at two years and cello lessons at three. French daycare (which is heavily subsidised by the state, and which children typically start to attend around these years) is remarkably unstructured. Instead, it’s felt that, by helping children see themselves within broader social contexts, that they themselves will begin to explore the world around them. The aim of parents and carers is to facilitate, set limits, but not to push. This means that French parents don’t simply identify themselves as parents. In the Anglo-Saxon world, this usually expresses itself as the promotion of ‘motherhood’ as an all-encompassing identity for many women. This is anathema to many (though not all) French women. Readily accessible and inexpensive childcare means that mothers can, and do, quickly return to the workforce. In France, full-time motherhood is not esteemed as it is here (in my view, quite properly). That doesn’t mean that French mothers don’t enjoy motherhood, but it doesn’t take over the totality of their identity. Those of us drawn to works about French food and culture (and the same applies to Italian) are, I suspect, convinced that there is a malaise in Anglo-Saxon culture that deifies goals and achievements and KPIs at the expense of broader artistic and cultural questions. What’s not to admire about cultures in which fresh, quality food is at the heart of one’s daily life? This is a fascinating work. Of course, it’s not perfect, and one wonders how far the philosophies presented extend into French society as a whole. Is it a largely metropolitan phenomenon? Or is it a middle-class phenomenon?. There were many socio-economic questions that cropped up as I read, and these were largely unanswered. One yawning gap is the migrant experience. On the other hand, this doesn’t pretend to be a thorough sociological study. But it was a fascinating and rewarding sketch of the philosophy behind French parenting. I thoroughly recommend it. And I’ve ever even had kids. Sister Fidelma, an Irish nun, travels with a party of coreligionists to Whitby Abbey. There, a Synod is to be held presided over by Oswy, Saxon King of Northumbria. At stake is which set of rites, Celtic or Roman, the kingdom will follow. At issue is the form of clerical tonsure and the dating of Easter. When the Abbess Étaín, the leading speaker for the Celtic faction, is murdered Fidelma must investigate the crime. An advocate in the Irish Brehon Court, she is well suited for her task. But Oswy, known to favour the Celts, must be impartial. She must work with Brother Eadulf, a Saxon from the Roman faction. As their investigations proceed and as the Synod continues, more murders threaten to plunge Northumbria into civil war. There is much to like about this first work in the series. The clash of Irish and Saxon cultures maintain a dynamic tension through the work and while Fidelma is a more rounded character Eadulf is certainly not two dimensional. Peter Tremayne (the pen name of Peter Beresford Ellis) is a Celtic scholar, and it shows in the detail that he brings to the work. Unfortunately, at times, it reads like an anti-Roman polemic. But, though it’s in the third person, the novel is clearly told from Fidelma’s point of view. Also, as her working relationship with Eadulf strengthens, Fidelma comes to appreciate (though still not necessarily agree with) the perspective that he brings. I found the clues a little telegraphed, having guessed the guilty party less than half way through the book. However, the political intrigues stop it from being too predictable. If you like this period of history then this should be a series worthy of your consideration. One of the joys of travel is exploring iconic tourist spots. But sometimes the best travel experiences have nothing to do with tourism. On our last trip to Bayeux, I spent our last full day wandering alone. Shelley was laid up with what turned out to be a broken ankle. I couldn’t wander far so that I could return to our room periodically with food and drink. So I couldn’t do a long walk. We’d already explored the town pretty thoroughly, but Bayeux is utterly gorgeous and I could quite happily re-visit what we’d seen. So I walked along the Aure river, which winds its way through town. I met a friendly cat. I saw people walking their dogs. I went south of the town and wandered to the graffiti-covered rail bridge. I promenaded. In other words, I just wandered aimlessly and saw what there was to see. Everything was delightful. But what I took notice of probably escaped the notice of the locals, because it was part of their everyday landscape. I took the photo above earlier today after taking out the garbage. Imagine a Bayeuxer wandering Adelaide and seeing this. They might be enchanted, or beguiled, or amazed, and a photo like this might end up in their album. Of course, it’s easy to find lovely cityscapes when the jasmine ‘s in bloom. But I think that a mindful traveller visiting Adelaide will always find something to delight. 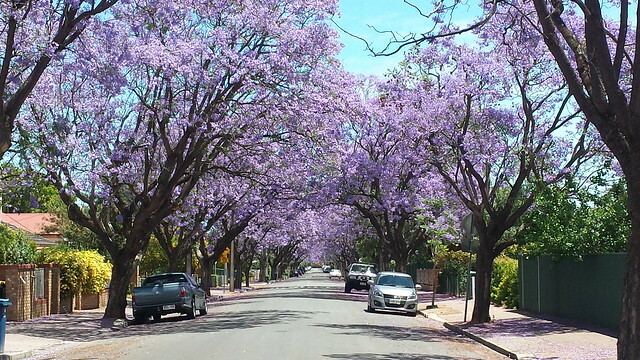 This isn’t simply because Adelaide is especially lovely. Though I enthuse about Bayeux, not every part is picturesque. It has its share of ugly apartments, rubbish-strewn lots and neglected buildings. But to me, none of that matters. It’s all part of Bayeux’s character, and to me is as worth exploring as the main streets. For those who are not just interested in the tourist spots, the act of travel helps make the traveller more mindful of what’s around them. Everything seems different, and the ordinary becomes enchanting. We become disposed towards finding the beautiful or the interesting because we are in a different place. Travel broadens the mind. Can travel help us to be mindful of the beautiful and interesting when we’re at home?